JUST A YEAR and a half ago, the most common question about Tiger Woods’s future was not whether he would win another major tournament, but whether he would ever play competitively again. After an unprecedented run of glory in which he won 14 majors in just over 12 years, Mr Woods saw his career derailed by an infidelity scandal, injuries and over-use of prescription drugs. Already on the wrong side of 40 years old, Mr Woods’s legacy appeared to be fixed: a star that burned brighter than any other but was extinguished far too soon, a victim of the hubris caused by too much success at too young an age. That was then. On April 14th Tiger unleashed his roar once again—literally. After winning the Masters Tournament for the fifth time and a major championship for the 15th, he screamed at the top of his lungs while lofting his arms and putter high into the air, before embracing his caddy, family members and vanquished rivals as he seemed to fight back tears of joy. Much like the broader narrative of his career, it was also the first time he had come from behind to secure a major: in all of his previous victories, he had led at the start of the final round. Mr Woods’s title is not only a personal triumph, but also a welcome boon to golf as a game. Only the presence of its biggest star atop the leaderboards enables it to compete with the most popular team sports for viewership and cultural relevance. No one would confuse the play of the grizzled, 43-year old Mr Woods with that of the 21-year-old phenom who won the Masters by a record 12 strokes in 1997. Whereas the young Mr Woods was so dominant that he barely seemed to be playing the same sport as his competitors were, this version seemed all too human. He frequently sprayed drives into the trees and misfired on straightforward putts, turning birdies into pars and pars into bogeys. He trailed by four strokes after the first round, by one at the cut and by two on Sunday morning. But just as Mr Woods has learned how to deal with adversity in his personal life, so too has he mastered how to limit the cost of mistakes on the golf course. Time and again, Mr Woods found a window through trees or a path around hazards, recovering from an errant tee shot with a pinpoint approach. (His driving accuracy of 62.5% was among the worst in the tournament, while his 81% rate of reaching greens in regulation was the best.) On the par-four ninth hole on the final day, his second shot landed at the far end of a long, downward-sloping green—a predicament in which the younger Mr Woods rarely found himself, where escaping with a par would feel like an eagle. Now a wily veteran, Mr Woods uncorked a lag putt for the ages. He aimed the ball on a line far above the straight path to the hole, and barely tapped it despite the vast distance. It almost stopped short as it approached the ridge—and then veered hard towards the hole, gaining speed as it plunged downhill, before coming to rest just inches from its target. The stroke he saved after tapping in for par wound up constituting his entire margin of victory, encapsulating the story of the tournament: unlike his rivals, Mr Woods refused to beat himself. Even after that par save, Mr Woods trailed Francesco Molinari by a stroke—a deficit that doubled after he bogeyed the tenth hole. 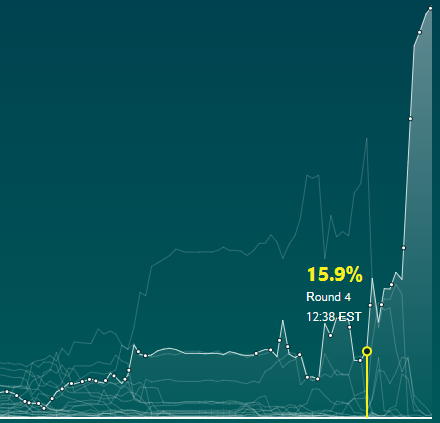 EAGLE, The Economist’s statistical win-probability model for golf tournaments, gave Mr Molinari a 65% chance of victory heading into the 12th hole, while Mr Woods languished at 16% (see chart). Just last July, Mr Molinari got the better of Mr Woods, when they were in the same playing group on the final day of the Open Championship in Scotland and Mr Molinari went on to win. This time, however, Mr Molinari succumbed to the demons that have undone so many a contender on the back nine on Sunday at Augusta National Golf Club. He left his tee shot short on the par-three 12th, seeing it disappear into the waters of Rae’s Creek, and then failed to make his putt for bogey. Mr Woods, in contrast, played it safe and made par. Three holes later, Mr Molinari saw his hopes of trying on his first Masters victor’s green jacket dashed for good. A poor drive on the par-five 15th forced Mr Molinari into an awkward approach shot, which bounced off a tree and wound up in the water as well. Mr Woods, meanwhile, displayed the steely resolve that made him an icon a decade ago. On the same hole that finished Mr Molinari, Mr Woods secured a birdie with a dead-centre drive, a meticulous approach to the green, and a clean two-putt. And on the next hole, the par-three 16th, he delighted the fans with a taste of his magic of yesteryear. His high-arcing tee shot first hit the green beyond one-putt range. But it then rolled sideways towards the hole like a heat-seeking missile, until he was assured of a tap-in birdie and a two-stroke lead. Even then, Mr Woods wound up needing stumbles from his rivals to compensate for his own. Both Dustin Johnson, who by most statistical measures is currently the best player in the world, and Brooks Koepka, who had won three of the past six majors he had entered, reached the 18th green at 12 under par with achievable, if challenging, birdie putts. Both missed—barely, in Mr Johnson’s case. That wound up making the difference in the tournament, as Mr Woods muffed both his approach shot on the 18th and his putt for par. No one dreams about winning the Masters with a bogey, but it was a fitting end to a gritty triumph. Must it be St Nicklaus? Mr Woods’s victory gives him a long-overdue 15th major title, leaving him three behind Jack Nicklaus’s all-time record of 18. Mr Nicklaus won his last at the age of 46, suggesting that Mr Woods has at least three more years to bridge the gap. Now that Mr Woods has rediscovered his form, might golf’s most treasured record now be within reach? The afterglow of Mr Woods’s win is probably not the best time to preach faith in statistical golf models. EAGLE gave him just a 2.2% chance of winning the Masters, less than half the probability implied by pricing in betting markets. Although such odds might appear uncommonly long, they were no knock on Mr Woods’s game: most major victors start the tournament with less than a one-in-20 chance. In EAGLE’s estimation, Mr Woods was playing sufficiently well before the Masters began that he was already one of the top ten players in the world. Instead, the daunting odds were merely a reflection of how much good fortune is required, in addition to elite skill, to beat a field containing all of the world’s best players over just 72 holes. Even Mr Johnson, whom the model anointed as the favourite and finished tied for second, had less than a 10% shot to win. The brutal arithmetic of large golf tournaments suggests that if Mr Woods is now a top-five player, he would be expected to win another major roughly once every 3.5 years. As a “mere” top-ten competitor, that frequency would fall to around one every six years. From this perspective, Mr Nicklaus should only feel threatened if Mr Woods manages to regain his former status as the unquestioned world number one despite his advanced age. That would mean following up this Masters victory with a steady drumbeat of scores in the 60s and finishes in the top 5 and 10 of PGA Tour events. (Mr Woods’s Masters performance alone has improved EAGLE’s estimate of his expected score on a typical course by over a tenth of a stroke per round). Otherwise, the smart money will probably remain on Mr Woods’s major-championship tally remaining at 15. However, statistical models rely on extrapolating historical patterns into the future. And since no one has ever played golf as well as Mr Woods did at his best, there is no precedent on which to train a model for the second act of such a career. 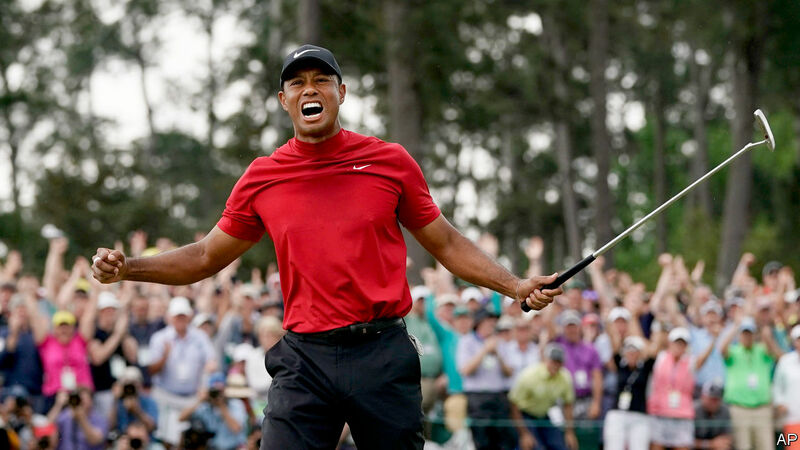 As the crowds roared following his every birdie and his rivals’ every misstep, distracting players two or three holes away, a victory that was still statistically improbable already felt inevitable in the heart of every fan who had seen Mr Woods in his heyday. Much to the delight of the lords of golf, even the most casual of observers will make sure to tune in the next time Mr Woods strides to the tee box with a major on the line.